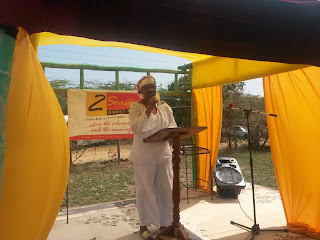 International poet and author, Lorna Goodison, brought her passion for writing and her wit to the fourth staging of the Two Seasons Talking Trees Literary Fiesta, held on the grounds of the Two Seasons Guest House in Treasure Beach on May 23, 2015. 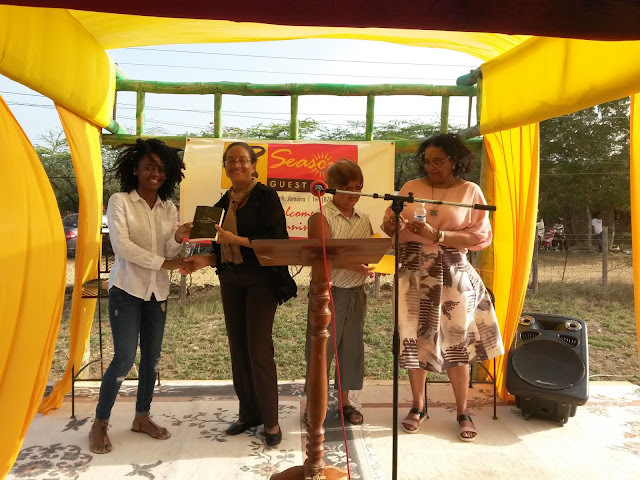 She was the featured reader at the Fiesta, which showcased the talent of established and emerging Jamaican poets and prose writers. Patrons from across the country were treated to an enjoyable and relaxing day, listening to the wordsmiths across many genres. This year, the organizers of Two Seasons Talking Trees Literary Fiesta, which was first held in 2011, teamed up with the UWI Department of Literatures in English (DLIE), Mona Campus, and the Gloria Lyn Memorial Fund (GLMF), which supports students of the department with bursaries and mentoring, to make the Fiesta the best one yet. Goodison's participation was arranged by the DLIE. Immediately following her reading at the Two Seasons Talking Trees Literary Fiesta on May 23 in Treasure Beach, international poet, Lorna Goodison (far right) was on hand to participate in the presentation of a copy of the historical bookThe Shopkeepers by Ray Chen to festival spot prize winner Gwyneth Ross (second left) by Roma Richardson (far left). Richardson is the 2014 bursary awardee of the Gloria Lyn Memorial Fund which supports students of Literature at the University of the West Indies, Mona. Trustee of the fund, Cathy Lyn, (second right) was a member of the 2015 staging of the literary event and her mother Gloria Lyn contributed an article to the book. The day saw the fourth staging of the literary event which is sponsored by the Two Seasons Guest House. Goodison, who is never far removed from her storytelling persona, easily selected from her oeuvre, engaging with the audience as she read or recited from memory. She started with I Shall Light a Candle of Understanding and moved into Guinea Woman; I Am Becoming My Mother; This is My Father’s Country (about Malvern St Elizabeth); To Mr William Wordsworth Distributor of Stamps for Westmoreland; Advice For Amy Jolly from My Seat in the Balcony, and Heartease “catching mercy rain in a zinc pan”. She touched on a piece of near forgotten history, resonating with the contingent of St. Hugh's High School past students who had gathered at the Fiesta, when she read the poem Our First Christian Martyr. The poem reflects on the disappointment displayed by students of Goodison's alma mater, when the Gleaner report of “Jamaica's First Christian Martyr” – a sister of a teacher at the school – turned out to be wrong, and there was no martyr to mourn. Lorna also paid tribute to the late UWI Professor Barry Chevannes when she read a favourite of his, Living Convertor Woman of Green Island. Earlier in the day, patrons were treated to readings from a stellar line up of poets, prose and blog writers, story-teller and a play. 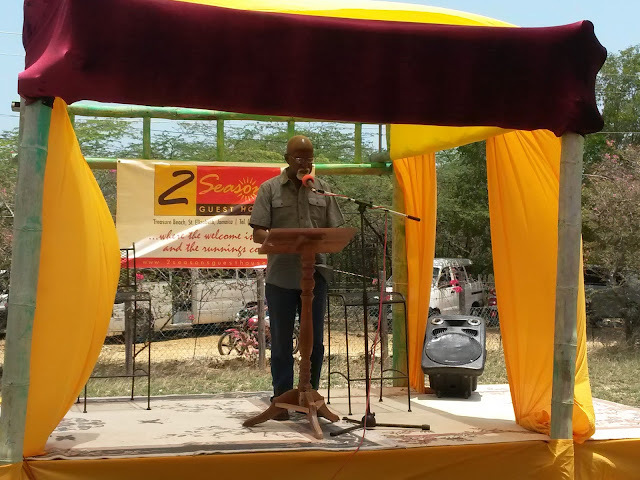 Jamaica's Poet laureate, Mervyn Morris, delivered some of his well-known poems including The Pond and The Day My Father Died. Poet Eddie Baugh read Monumental Man; Tanya Shirley presented from her two collections She Who Sleeps With Bones and Merchant of Feathers; Easton Lee did selections from his latest anthology Kiss Me Granny and included his poem My Mother is a People; Amina Blackwood Meeks performed Kiss Me Granny, a story of a woman of certain age which has the line, “and being from the old school…ahem…school of certain values”. The poem explains the circumstances under which a mature woman turned down the advances of a younger man. Cherry Natural, through her performance poetry, called on women to protect and defend their physical and emotional selves. UWI Mona Poetry Slam winner Peta-Gaye Williams delivered her love for words. Telling stories, writer Victor Chang brought mirth with the tale of Miss Daisy and Miss Chin; blogger Annie Paul read her popular post Kingston, Kerala and Ethiopia which uses her life as a convergence of the three subjects. Novelist Sharon Leach read a steamy section from her first book What You Can’t Tell Him; Mandisa Parnell read from her romance The Boy Next Door, when a teenage girl tries to get over a crush; Carol Dunn revealed a quiet hurt of the female hero in Mountain of Inheritance and Gwyneth Harold Davidson, in honour of the casualties of the 150th anniversary of the Morant Bay Rebellion, read an excerpt of Young Heroes of the Caribbean. The audience was also treated to the restaging of the 10 minute play, Devon, written by the MC for the day, Fabian Thomas. 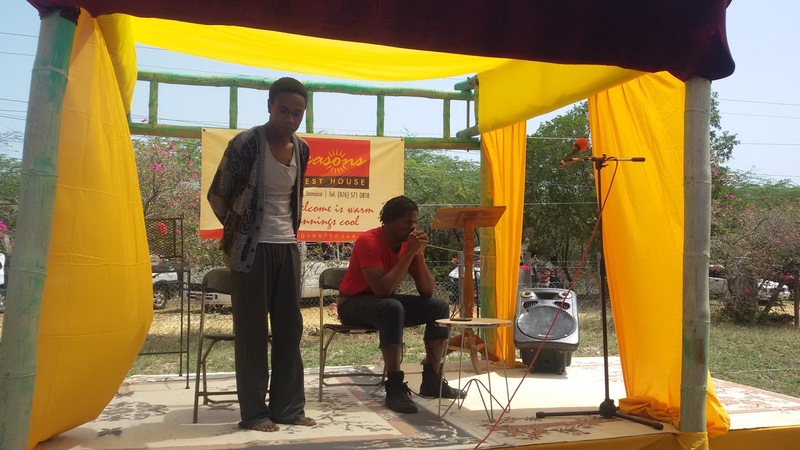 Acted by Jomo Dixon and Darian Reid, the skit is set in the May 2010 Tivoli incursion and examines choices, allegiance, the toll of violence on families and the bond between father and son. Participants in the children’s programme that was organized by Ingrid Blackwood presented a skit crafted during the day called Those Who Came, representing the theme of the Fiesta. The Trees That Feed Foundation presented a Julie mango tree to the Two Seasons Guest House in continuation of its work. The Billy’s Bay Drummers - two students of the Sandy Bank Primary School - also performed self-composed pieces. Sponsored by the Two Seasons Guest House, the Talking Trees 2015 partners included the Jamaica Tourist Board; Jamaica National, Jamcopy, Treasure Beach Hotel, Taino Cove Guest House, and the Treasure Beach Women's Group.